Today is the anniversary of the day I descended into hell. A year ago, I wrote a post on how women’s pain is often dismissed by medical professionals, and how I struggled for nearly two years to get a doctor to take my accounts of pain seriously. I had becoming convinced I was deluding myself and triggering a physiological reaction to anxiety; after multiple tests affirming that my body was “normal,” I too, believed that the pain didn’t exist. Except it did, and it persisted. After I wrote the blog post, I received numerous messages, emails, and tweets from people—mostly women, but also men, confiding the stories of women in their lives whose stories intersected with theirs—stories of frustration, of being ignored by doctors, and stories of pain. So much pain. It overwhelmed me, and I meant to write a follow-up post, but I never did. I never did because not long after the original blog post, my health rapidly declined, and I was hospitalized for six weeks. The consequences of that hospitalization, and several more after that, a major surgery, more complications, and an 8 day stay at the ICU, has traumatized me. It’s been, in short, an insane year. This is the story of my medical trauma. I don’t even know to where to begin. There’s so much, so many days, so many things, so many tears, so many hospital rooms, just so, so, so much. If I close my eyes to recall the beginning, all the memories swirl, the many voices intensify into cacophony, the colors blur into greyness, and then my head hurts and I must open my eyes again. I can’t even start with the pain, because it’s such an ingrained part of my experience, that it is there, in everything. Just two days prior, the pain was unbearable. It never changed, it was always in the left lower quadrant of my abdomen, this consistent, sharp, stabbing pain that sometimes subsided, sometimes worsened. I spent half the day sobbing from the pain. Lying on the sofa because the bed was uncomfortable, clutching the hot water bottle and repeatedly refilling it to ensure it stayed hot – hot enough my skin burned, scars remained. I thought I was certain what the pain was, having finally received a diagnosis after nearly two years of waiting. But it persisted, worsening every day, leaving me immobilized. Confined to bed, face stained with tears, body aching to the point I didn’t want to be touched. My husband Geoff insisted I go visit a doctor, but my regular family doctor’s office was closed, and I didn’t want to see any other physician. As the pain worsened during the afternoon, I finally caved and agreed to go to the walk-in clinic. There, we explained to the doctor that I was diagnosed with a cyst on my ovary, possible endometriosis, and thought that my latest stomach issues were another symptom of IBS, which another doctor had suggested I had. He disagreed with the IBS diagnosis, claiming that what I had was likely an inflammation of some sort, but he couldn’t be sure. When he proceeded with the abdominal palpation, I screamed out in pain and collapsed on the exam table. Through my tears, I saw his expression had changed. “You need to go to the hospital,” he said. “I’ll write my notes for you to take to emergency admittance. I don’t want to scare you and I can’t say for certain, but this is not IBS or a cyst, so you need to get proper tests.” Worried, Geoff and I headed home, packed a bag of work and books (because we didn’t know how long we were going to be waiting), and walked across the street to the hospital. You know how hospitals are. There’s lots of chaos, lots of waiting, lots of nurses, aides, and physicians. You sit there, lost in the fog of it all, just waiting for your name to be called. You see the same doctor and mention that he sent you home earlier. Geoff argued with another male doctor, insisting that we’ve been coming repeatedly and it’s time they sent us a female doctor, preferably a gynecologist. I’m sent to many different rooms for tests. Blood test. CT test. Ultrasound test. I sit in a wheelchair, hooked up to an IV bag full of hydromorphone. I thought the cyst I was told I had, had burst. 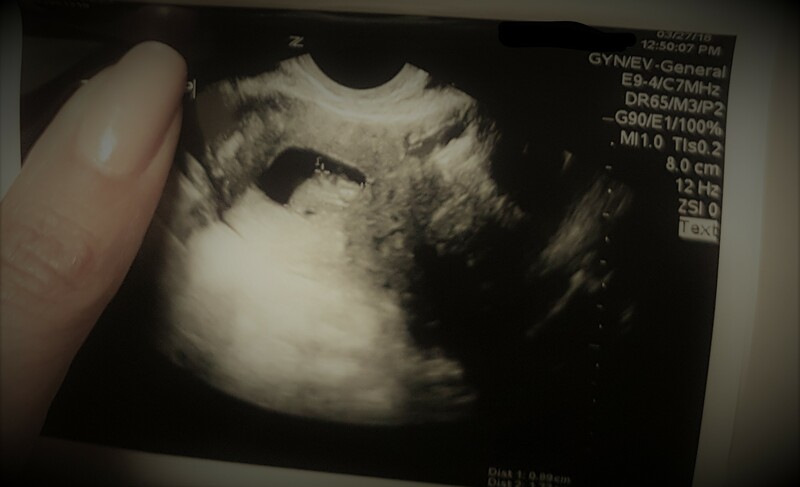 The ultrasound technician couldn’t find it, and she too, had the same worried expression the walk-in clinic doctor had. No one is telling us anything. We’re waiting for hours, until a female doctor arrives. “There’s a large mass in your abdomen,” she tells us. She’s not being clear what that means. An endometrial mass? A fibroid? She won’t say, but tells us that she’s ordering more blood tests. We never see her again, because her shift ended and our file got passed to another doctor…and then another doctor, the laughing one. He was in the exam room for no more than 10 minutes. We had questions – mostly, what is the mass? Why is no one telling us anything? He laughed as he looked at my case file; Geoff and I looked at each other in bewilderment. The doctor revealed that they had been working with the diagnosis that I had leukemia, but then conflicting blood tests suggested otherwise, so he ordered more blood tests, and they were inconclusive too, but then he didn’t want to order another CT scan because the female doctor had already ordered one, and anyways, we should be happy because he’s certain they were wrong and it’s not leukemia at all, possibly nothing but I should definitely follow up with the gynecologist he recommended and also with another hospital to schedule a MRI. Stop. Stop the jumble of words. Tell me first – what? Leukemia? When did leukemia enter the picture? Why were they deliberating leukemia? Stop. Stop and tell me. “But it’s not leukemia,” he laughed, as he signed a prescription for morphine. Here I thought I just had a burst cyst, maybe a worsened case of anemia. I stared at the white piece of paper, another bottle of morphine to pick up. I never filled it. Let me fast forward now, because there are so, so, many things. Being back in the hospital two days later, after Geoff called an ambulance when I had a severe pain attack and couldn’t stand up, couldn’t walk. I sat in in the wheelchair, wrapped in a blanket, my pjs, and socks in the waiting room. No shoes. The ambulance came too quickly and they put me on the gurney without my shoes. The room was full. I stared at the guy screaming in agony because his eyes were on fire. We sat next to the automatic doors, the doors that opened to taunt us – they are there, those people in blue scrubs. You are here. Here you wait, there they laugh. He sees me, the same one with the smug smile, black hair and green eyes. He sees me and I watch as he processes how he recognizes me, the memory of the laughter seared in my brain. He sees me, sees me knowing who he is. He sees me, and in that instant realizes who I am, turns and hurries away in the opposite direction. I sit there, blanket around me, socks without shoes. We were there for hours. I asked to leave. We walked out of the hospital, walked home, me with my socks and no shoes. Returning to the hospital yet again, this time to see the gynecologist. He told us there were “nodules” present all over my abdomen, and a large, 8 or 9cm mass that appeared to be growing around my bowels. The mass, that was the source of that throbbing, stabbing pain in my left lower quadrant. It had been growing for two years, maybe longer. That doctor at the walk-in clinic? He felt it. The ultrasound technician? She saw it. No one told me anything. Geoff and I lying in my bed in the maternity wing. We’ve just been married four months and spent that night talking about what I wanted him to do if I die. I was 35 years old. Screaming in pure agony when the vaginal biopsy was done. On the other side of the procedure room, Geoff deals with his own torment, as not an hour earlier, another practitioner confessed to him that he was certain I had malignant cancer. The transfer ambulance taking me to the Cancer Hospital, where I was to be admitted for surgery. The oncologist making a plan of action that includes a possible bowel resection and hysterectomy. “Wherever the nodules are, we’re going to take it out, we need to be as aggressive as possible. But we won’t know until I open you up.” I sat in the wheelchair, hooked up at the IV of hydromorphone, and nodded my head. I struggled to understand what she was saying, what she had written down. I signed the consent form. The operating room is being prepared. There are surgeons from 4 different specialties. The oncologist arrives with her assistant, both of them dressed in their surgical scrubs. No. Not yet. Geoff isn’t here. He’s gone to get lunch, he’s coming right back. Please not now, don’t let me do this by myself. I don’t have cancer? But then why am I in the Cancer Hospital? Why did you tell me you’re preparing the operating room? Wait. What happens now? Who’s removing this mass that’s still in here? I don’t understand why they all took me more seriously when they thought I was a cancer patient than when I was a gynecological patient. I don’t understand. Waking up in the middle of a colonoscopy when the scope hit the mass. Seeing a gynecologist at a special endometriosis clinic. Being prescribed a chemotherapy drug that would send me into menopause. Having the worst, rare, side effects while on the drug. Spending Christmas drugged out most of the time because the pain was unbearable. Packing up the apartment and moving to the U.S. to start a new job, Geoff driving through a snowstorm and frigid cold weather for 14 hours, me drugged out or sleeping the entire time. Going through opioids withdrawal two weeks before the start of a new teaching semester. Barely managing. Barely surviving. So much pain in this bruised, broken body. Six months later, I had surgery. I had complications. I survived. I healed. I received the formal diagnosis of endometriosis. I was also told that two pathologist reports confirmed complex hyperplasia with atypia, otherwise known as endometrial precancer. The risk of uterine cancer is high: 25 to 50% of women eventually get cancer. These abnormal cells are usually found in the endometrium, the membrane that lines the uterus. Mine were found on my ovaries. Apparently, this is so rare that my gynecologist called a team of experts and none could figure out what prognosis to give me, or what treatment to proceed with. We don’t even know if the risk factors for cancer are still the same. We don’t know anything. We don’t even know why, two months after my surgery, a rash broke out on my body, I began to hyperventilate, and my blood pressure dropped to dangerously low levels, while my temperature rose. We don’t know why I needed two EpiPen for anaphylaxis, when there was little evidence that I was having an allergy attack. I stayed in the ICU for eight days, got discharged, then returned to emergency. We have no idea, but during the worst of it, when the doctors and nurses scrambled to revive me, I turned to look at Geoff and saw the fear in his face. I looked at him and I silently whispered, I will not die. As I’m living my life, attempting to stay healthy through diet, exercise, low stress, and so on, I’m waiting for more tests and more experts to figure out where to go next. But I’m also traumatized from the events of the last year. I wake up in the middle of the night with nightmares, I’m flooded with memories of awful pain. The constant use of painkillers clouded my memory, but every once in a while, the clouds part and I remember things. Then the anguish takes over me. Medical trauma is defined as the physical and psychological responses to pain, illness, fear, or injury that a person experiences in a medical setting. It can seriously derail a person’s mental health. One bad medical experience can scar you for life; multiple bad experiences can take its toll. It’s important to understand trauma, especially for patients of color and other marginalized groups who suffer disproportionally within systemic racism in institutionalized medicine – black women, in particular, face a life-or-death crisis in hospitals, especially when delivering babies. And the effects of trauma can also take a physical toll on your body; in my case, I suffered severe hair loss. I’m doing the best I can. I still sit in my car in the hospital parking lot for 15 minutes before an appointment, crying and struggling to gather courage to enter the hospital, but I’m doing the best I can. I have a friend who had a sudden cardiac event and expressed feeling so similar to yours; the fright, the recurring nightmares, the panic, the fear. I sent her to a PTSD specialist and she said, for the first time, she felt HEARD! I would recommend the same to you my friend; someone who hears your fear, painc, terror and can help. I’m so sorry to hear about your experience. I have had many many operations and health problems and I can feel all those hospitalizations taking its toll on me, it is hard.